Rural Coworking is a Thing, and We Like How it Sounds! Coworking is no longer solely a playground for the young, hip, and urbane: here’s a look at what it’s like to cowork in the Berkshires. The south-facing windows provide abundant natural light to the varied workspaces at Cloud85. Power is supplied through coiled cables from the ceiling, maintaining the ability to reconfigure the space to accommodate the growing membership. Image courtesy of the author. By now, coworking is a standard concept among city dwellers. 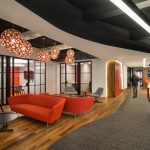 Once a hip, new trend among the millennial crowd, it is now arguably mainstream, with an estimated 781 coworking spaces throughout the US, according to a 2013 report — a considerable increase from the very first of its kind, which opened only 10 years ago. A simple Google search illustrates the dense concentration of these spaces within cities: there are some 76 coworking offices in San Francisco alone, representing almost 10 percent of the entire pool of such facilities nationwide. This is not to say that every urbanite regularly uses a coworking facility, but it is likely that if they were to be stopped on the street, they could not only explain it, but tell you where the nearest one is. The same cannot be said for most rural communities, towns, villages, and small cities across the country. However, a burst in the economic bubble has recently collided with a trend towards more mindfulness, changing the geographic trajectory of many young people — singles, couples, and families alike — who are looking to move away from the hectic pace and skyrocketing costs of city living to the bucolic rhythms and affordable cost of country living. It is only logical then that they would bring the concept of coworking with them. Enter North Adams, a small New England town a stone’s throw from southern Vermont, on the western edge of Massachusetts. Nestled in the picturesque landscape of the Berkshire Mountains, the colors on the ridgeline are percolating, building anticipation to the full bodied colors of fall, much like the coveted first sip of morning coffee. It is here in this former mill town, still grappling with social and economic troubles, where Cloud85 floats two stories above a resolute and determined Main Street. It is here in this former mill town, still grappling with social and economic troubles, where Cloud85 floats two stories above a resolute and determined Main Street. The contrast between this rural coworking facility and that of a major metropolitan area are evident before you even enter the building, as parking is remarkably easy to find. Named for its address at 85 Main Street, Cloud85 occupies a mere 1,370 square feet of the 60,000 square foot New Kimbell Building, a stately brick and stone building built in 1902, but don’t be fooled by its modest size. As current in its design as it is inconspicuous in its location, once inside, it offers everything you would expect to see in any coworking facility in San Francisco, Boston or Manhattan – just on a much smaller scale. 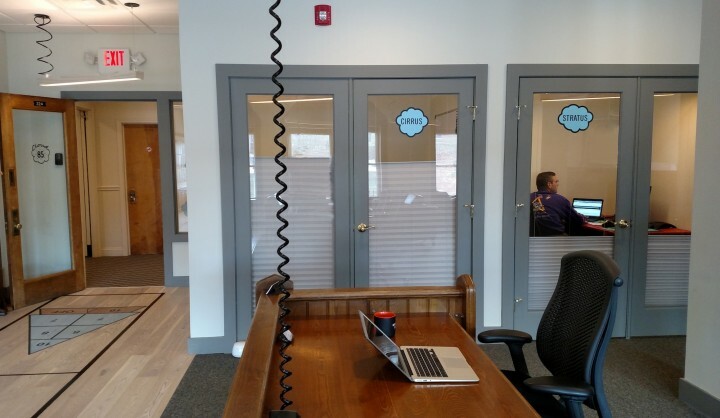 Launched in January of this year, Cloud85 is the first coworking facility in Berkshire County. Since its launch, founder and owner Jeffery Thomas has learned how to succinctly describe the space: “It’s somewhere between an office and a coffee shop with the same business model as a gym.” This soundbite is necessary because here in Berkshire County, coworking is not the buzzword it is in major metropolitan areas. Perhaps this is not surprising, as coworking is particularly popular among the 20-30 somethings, an age demographic that is significantly underrepresented in Berkshire County. “Where coworking is part of the urban culture, we had to build a model with a long ramp on membership road because here in North Adams, this style of working involves changing behavior,” said Thomas. However, this patient, pragmatic approach has proven successful as it is steadily adding three to four new members each month to its already stable membership base. “We have kept operating costs to a minimum, and as a result have been cash positive since day one,” he said. A striking focal point of the space features true “picture windows”, displaying vintage photos of North Adams. The wood detailing throughout the space pays homage to the architectural history of the building. Image courtesy of the author. Understated in its design and thoughtful in its execution, the space celebrates the history of the building by highlighting beautiful architectural details such as the wood trim arches over the large, south-facing windows, mimicking the architectural detail on the exterior of the century-old building. Organized into a mix of workspaces, including soft seating and collaborative work areas, it also offers options for a range of individualized work including desks reminiscent of library carrels, and two enclosed rooms that can be reserved in advance, perfect for small meetings, heads down work or conference calls. Historic black and white photos of North Adams are mounted to foam core panels and framed out in wood to give the impression of a large, oversized window. The effect is simple yet striking, and the mingling of old and new creates an interesting paradox symbolic of the challenges the very space faces as a result of its geographic location. Small rooms can be reserved in advance by members and offer a private space for small meetings, phone calls or heads down work. Image courtesy of the author. Indeed, many of the things that make country living attractive and ultimately lure city dwellers to this way of life are the very things that pose challenges for a coworking facility to be successful. Ben Cohen and Will Vincent are two software developers and Cloud85 members who can personally attest to that. Both in their early 30s and straight out of Silicon Valley, they’ve worked at the likes of Microsoft, Salesforce, and a variety of tech startups. Both came to Berkshire County for personal and family reasons, a lower cost of living, and in an effort to “get out of the rat race”. It wasn’t until they became members of Cloud85 that their paths crossed and they have since launched a startup called SimpleSignup, a signup and payment app designed to emphasize simplicity for both the organizer and the customer. It’s somewhere between an office and a coffee shop with the same business model as a gym. Silicon Valley may be the mecca for all things tech and the birthplace of coworking, but “it’s not the land of milk and honey,” says Vincent. Cohen agrees, recalling a startup where they only had access to a meager DSL connection. Of course, Berkshire County isn’t the land of milk and honey either — along with the predictable challenges of operating a coworking facility in a rural area like the scant population density and a limited working knowledge of the concept of coworking, for instance — I’ve observed a few interesting paradoxes which lead me to think maybe perhaps you can have it all. Just not all in one place. Paradox 1: No traffic but long commutes. For starters, there is the issue of traffic. Only here in North Adams, there is actually no traffic. Really, there’s quite simply none. Sure, you may run into the occasional construction, but it will only put you back about five or six car lengths, not land you in gridlock. But while you won’t find yourself sitting in bumper-to-bumper traffic for an hour, you may find yourself sitting in your car for an hour to travel the distance needed to get to the only coworking facility in the area. Even Cohen and Vincent, who live only five minutes away (by car) in neighboring Williamstown, say that it would be nice to be able to walk to Cloud85. Paradox 2: Less money begets more space. Compare real estate prices in Berkshire County to that of San Francisco and it’s difficult not to call your real estate agent on the spot. Not only are prices and real estate taxes significantly lower than in most metropolitan cities, you get much more space, acres of property that just aren’t available (or attainable) for the average person living in a metropolitan area. So while people in San Francisco are forced out of their 345 square foot studio apartment in search of a little bit of elbow room, in Berkshire County, many people have more space than they need, and can easily convert one of the 345 square foot rooms in their old New England farmhouse into a home office. “This has required education on our part, showing them a new way to work that can eliminate distractions found in the home and provide connections and collaboration you wouldn’t get otherwise,” comments Thomas. Paradox 3: Everybody’s like me because nobody’s like me. Among these paradoxes, one thing has remained consistent, reliable, and stable: community support. “The support and partnerships throughout all of this have been really lovely,” said Thomas. He likens it to the Stone Soup folk story, where hungry strangers influence local townspeople into sharing their food to add to the “stone soup”, yielding a delicious, hearty soup that otherwise would not have existed. Between members who help recruit, local media who helps promote, and neighboring businesses who help with some of the day to day operations, the result has been truly productive, collaborative, and community based, which happen to be the three pillars of Cloud85’s value proposition. And so, while the future of rural coworking has yet to be determined, one thing is for sure: in Berkshire County, the soup’s on. And it sure does smell good.